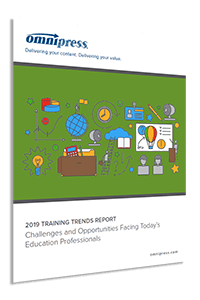 For the third consecutive year, Omnipress surveyed over 100 continuing education professionals from associations, corporations and other organizations to understand how education is currently being delivered to learners, and what changes lie ahead. The good news for the training industry is that, due to the perceived value of ongoing training and education, most organizations plan to increase the breadth and depth of their programs. This does present some significant challenges to training and education professionals who already manage a broad portfolio and wide array of responsibilities—particularly as they are also tasked with navigating changes in learner preferences and emerging trends and technologies. How are organizations delivering their educational programs today, and what changes do they foresee in the future? What challenges are organizations facing in delivering this content? How much are organizations focusing on new and emerging trends? Are organizations prepared for young professionals?